In support of our thermoset molding services, Woodland Plastics Corporation also has capabilities in thermoplastic molding. Woodland Plastics can manufacture high quality, custom molded products from engineered thermoplastics with fillers such as fiberglass, minerals, and additives including UV stabilizers and flame retardant materials. Woodland Plastics’ thermoplastic molding capabilities include injection, compression, and injection-compression molding, and can maintain tolerances of .002” to .006” per inch. With an industry-leading advanced manufacturing ERP software system, Woodland Plastics machine has the ability to track and monitor real-time production data. 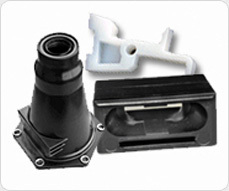 Aside from molding, Woodland Plastics offers an array of secondary operations and services including assembly, deflashing, drilling, packaging, painting, riveting, and tapping. For questions on Woodland Plastics' thermoset molding capabilities, please contact us via email at sales@woodlandplastics.com or reach us via phone at (630)-543-1144.